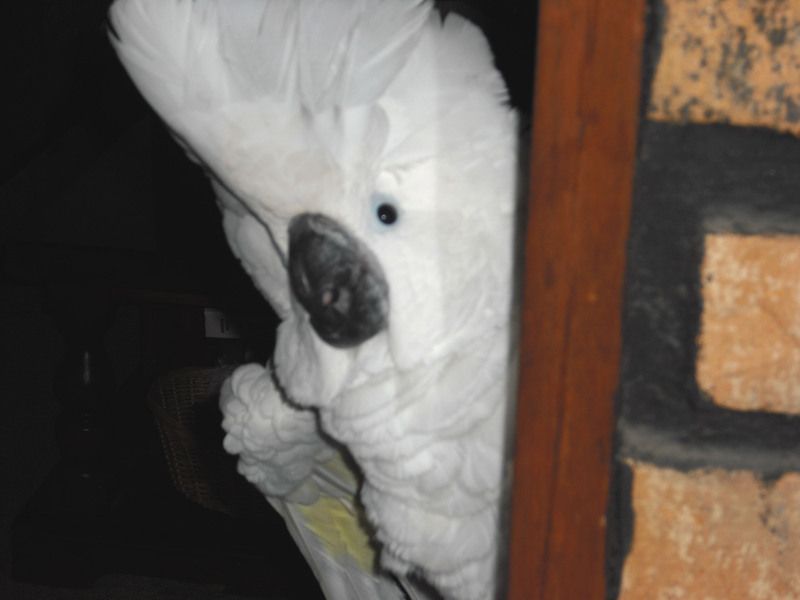 I meet people all the time that think it is so cool to own parrots! First off we don’t own them, we are their slaves, companions, friends and many other things… but we do not OWN them. They are living, breathing, wild, feeling creatures that were trapped into this life we share now. There is nothing cool about sharing your life with parrots, it is hard work and non stop. It is a job that most people will not commit to forever, that is why there are so many thousands of parrots in rescues today! So when I explain to “Non bird people”, how much work is involved in caring for these magnificent creatures, that look slowly comes across their face. Yes you can easily see it lol. They are wondering “why on earth would you do this” and “are you crazy??? ?” Well those of us who love our angels can honestly admit that “yes” we may be a bit crazy, however when we looked into our Angels eyes… we saw something more. We saw their very souls crying out for what has been taken from them. They touched our hearts with their amazing souls and our lives were changed forever. Somewhere at sometime someone looked at a beautifully colored parrot and decided they wanted this magnificent creature for their very own. They gave no concern as to the fact that this angel was meant to soar and fly in the heavens. They just wanted to posses it. No thought ever given to the fact that these creatures were given wings for a purpose, or that the intelligence of these feathered beings was comparable to a young human. Just plain and simple greed and no care or thought for the well-being of the parrot at all. So ripped from the wilds and brought into captivity and of course others wanted one also, and so the trade industry began. Thousands were breeding, because these beautiful creatures were wanted by many. What a way to make some big dollars. Toss them in a cage together and make some eggs!!! And no need to let them stay with their parents, sell them fast and young so the parents will lay more to replace the eggs that were ripped from them far too fast!!! Babies birds are adorable and cuddly, everyone wanted them. So thousands were sold, without any advice or training given. No need to waste time on such things, that might cut into profits. Who cares what happens later on in this very long living creature, profits were being made! But wait, what is happening now? These babies are growing up! OMG they are so loud, they aren’t content to be confined to small cages??? They destroy everything…just like they were wild creatures??? My furniture and cupboards are being destroyed by these ungrateful birds!!! Why are they chewing on all the wood in my home??? They don’t want the food I am giving them, they throw it all over the place and make such a mess!!!! OMG and now they are becoming adults and getting all hormonal and aggressive, geez I gave them a cage and some food, what more can they possibly want??? What happened to the cute lil fluffy bird I brought home??? He bites and attacks me all the time!!! What have I gotten myself into, I just can’t take this anymore. So off to the rescue they go, or worse to a room away from the only family/flock they know. To be confined and sentenced without even a trial. So today while there are thousands in rescues and shelters across the nation, there are even more who are locked away and never heard from again. How many are abused, neglected or abandoned until death mercifully takes them? Why? because someone thought it would be “cool” to have a parrot. These are wild creatures who have not been domesticated for hundreds of years like dogs and cats. They were never intended to be kept in homes and cages. They were given wings for a purpose folks! Those of us who have looked into the eyes of these magnificent creatures and seen into their souls understand. And so we fill our homes with all we can rescue and pray for all those we cannot. We have seen why their hearts ache and yearn for something that we just can’t give back to them. We have seen how they turn on themselves by plucking and mutilating just to escape the horrible lives they have been captured into. These precious angels have no voice for themselves. Those of us who love them are their only hope. Every time a bird is bought, we are paying the very people who started the destruction of these wonderful angels. These are gifts from God and we are responsible for the pain and suffering that is being brought on them. As I looked into the gentle loving eyes of my own Angels, I made them a promise and I intend to keep it! Love the site! Are you connected with Tina? She has a site that has been around for awhile called Our Feathered Angels. I love to visit her site and I just found you, adding you to my favorites. Wishing you contunued success! I am not connected with Tina or her site, however I have visited her site and have enjoyed her articles and links. I have also referred folks to her site as well :). My main goal and purpose is to share all the information we can possibly find, to raise awareness on parrot care and the crisis of the over population. The more of us working together…the better for the parrots we all love so much! A beautifully written piece! I have lost a lot of sleep over the news stories of hoarders and birds in horrible situations, but the ones that are locked away and suffering in a dark room are the ones that really haunt me. As usual you have captured the spirit I think every one of us has thought about at one time or another. I’d love to see my own go free without the bonds that tie them to us if we could. But I can only do what I know is best for them while they are here. May God have mercy on us for what we as humans have done to them for making his creation prisoners of our own, no matter our intentions.